This post probably contains affiliate links. You can read the details about what that means here. 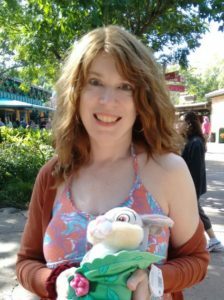 Click here to learn how this blog makes money -- and how you can too! 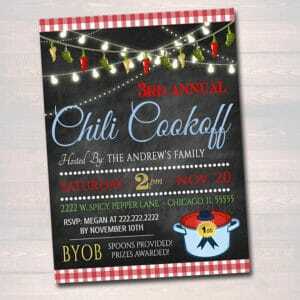 Chili cook-offs are a great way to get together with neighbors, church members, or co-workers. It’s fun, easy, and inexpensive. And who doesn’t love chili? 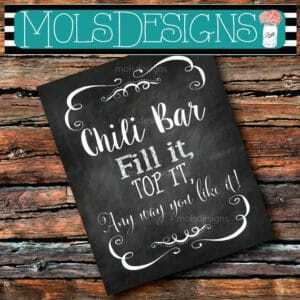 Since my post about Jamie Deen’s award-winning chili recipe is by far the most popular post on this website, I decided to do some research. 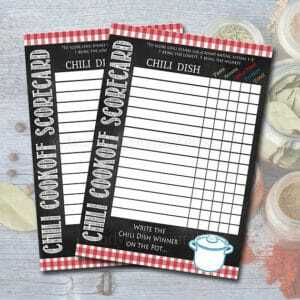 These tips will make your chili cook-off so fun and delicious that your guests will want it to become an annual tradition! 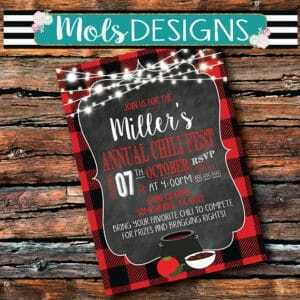 In addition, I also found several handmade and inexpensive items on Etsy that can help make the event more run and run more smoothly. 0.1 Step One: Round Everybody Up! 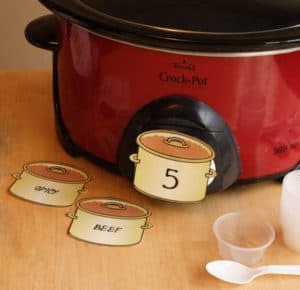 0.3 Step Three: Label the Chili Entries and Have Everyone Vote! 0.4 Step Four: Give Out Awards! 1 Click here to add this to your Pinterest food board! Step One: Round Everybody Up! 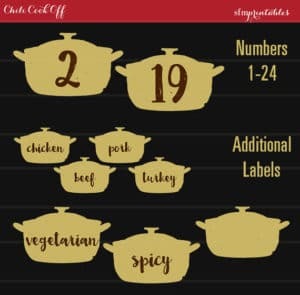 Invite your guests to bring their favorite chili, hot and ready to serve in a crockpot, along with a ladle for serving. Try to encourage them to consider different varieties, such as vegetarian or white chili, or maybe a recipe with a surprise ingredient. That’s a lot more fun that every single person bringing chili made with ground beef and red kidney beans. Don’t make a chili entree mandatory, however. As long as you have about 3-5 entrees, that’s enough to have a successful contest. However, if you’re inviting a lot of people, you might want to consider limiting the entrees to the first 10-12 people who RSVP (or sign up, if it’s an office setting with a sign-up sheet.). After eating ten different chilis, they all start to taste the same. 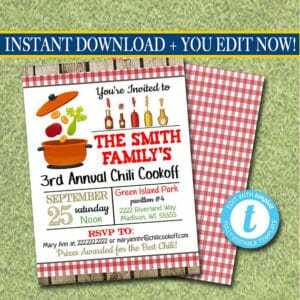 Here are some cute printable invitations I found on Etsy. Of course, you can always create your own, use Evite, or just slap a sign-up sheet on your office bulletin board. 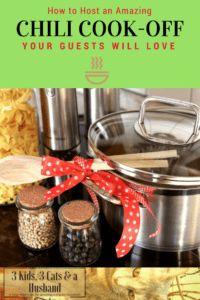 Make sure you have a couple of power strips and extension cords on hand so that you can easily plug in everybody’s crockpots without blowing a fuse! Also, of course, have plenty of bowls and spoons on hand (you might want them to be disposable, especially if you’re having a lot of guests), and an extra ladle or two in case some people forget. 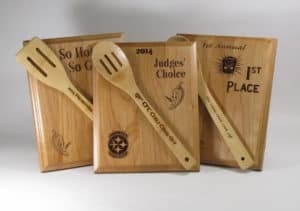 One thing I’ve experienced at chili cook-offs that I’ve attended in the past is that, if all you have to offer is bowls and spoons, people might just eat the two or three chilis that appeal to them and then quit. Since ideally you want everyone to sample every entree, consider putting out these 2-ounce plastic cups for sampling, and then plan to bring the bowls out after everybody has voted. 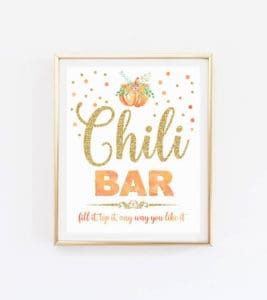 Since “multiple people scooping out chili” usually equals “mess,” I’d recommend covering your tables with something like this gold foil paper, which looks festive and makes clean-up afterwards super-easy. If there are going to be a lot of kids at your event, consider a table of two for them that are covered in brown craft paper and leave out boxes of crayons so they can draw, doodle, or play tic-tac-toe. 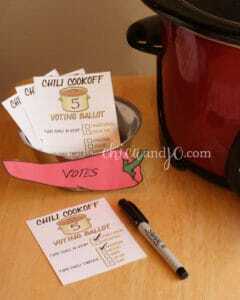 Step Three: Label the Chili Entries and Have Everyone Vote! It’s a lot more fun and interesting to make the entries anonymous with numbered labels. People can discuss whether “number 2 is too spicy” or “number 5 is my favorite” without feeling like they’re being rude. You also might like the labels to be color-coded to identify the heat level. Of course make sure there are plenty of voting ballots and pencils for everybody, and have some sort of container set up that people can drop their finished ballots into. Once all the votes are in, break out the bowls and let everybody chow down on their favorite! Step Four: Give Out Awards! The awards don’t have to be fancy or expensive. 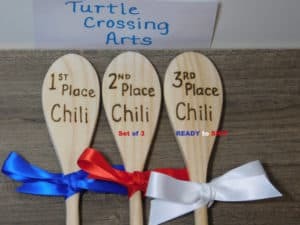 A simple certificate is enough to give a sense of accomplishment and make it “official.” Prizes can also include things like a bottle of hot sauce, a cookbook, pot holders and/or aprongs, or a tin of homemade cookies. Click here to add this to your Pinterest food board! 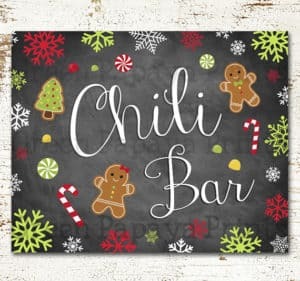 My school where I work at is having a Chili Cook off. On March 22nd, 2018. I’ll tell you how it went, I’ll be making the Chili you made. Three Kids, Three Cats, and a Husband is a participant in the Amazon Services LLC Associates Program, an affiliate advertising program designed to provide a means for sites to earn advertising fees by advertising and linking to Amazon.com.